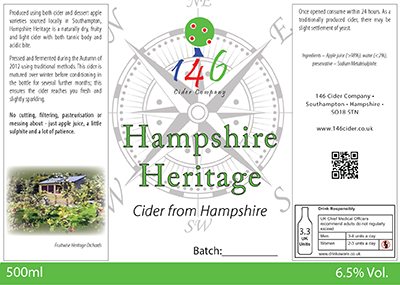 Hampshire Heritage is made from over 25 cider and desert varieties of apples, blended as a 50/50 mix to give what we refer to as a 'Hampshire style of cider'. This blend produces a near dry cider that has plenty of tannin and body whilst retaining a good sharpness - stopping it from being bone dry. This cider is exclusively made from cider and desert apples sourced from the Fruitwise Heritage Orchards near Southampton, making it a truly Hampshire born and bred cider. It is supplied as a draught, traditionally flat cider, and as a bottle conditioned naturally sparkling cider. As it is unfiltered, expect some yeast sediment in bottles, or a slightly hazy draught. 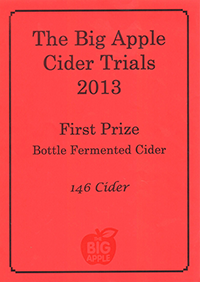 Hampshire Heritage, made in the traditional method won 1st prize at the Big Apple Cider Trials in Hereforshire, 2013. Fermentation was via natural yeast and the fruit was pressed from September through to December 2012.